In Christianity, Epiphany is the moment of revelation of Jesus as the incarnation of God. It is one of the Christian holidays and is celebrated all around the world, in Russia included. However, it is not Russia if they don’t have their unique and distinguished tradition. Here you will learn about History of Epiphany tradition in Russia. Before we step into the Epiphany itself, let’s get some insight on Christianity in Russia. Religion in Russia is diverse, and the majority of Russians identify themselves as Christian especially the orthodoxy. Over 58 millions of Russians follow the Russian Orthodox Church. The orthodox church itself is the second largest church and also among the oldest ones in the world. Russian Orthodox church is founded in the 14 century. The highest seat in Russian Orthodoxy is the Patriarch of Moscow and all Russia. Epiphany marks the day when John the Baptist baptized Jesus in the Jordan River. According to Christian orthodox belief, It’s the event in which the holy trinity manifested themselves to humanity. Christian around the world have different traditions in celebrating this moment. In Russia, it marked with the cutting holes in the river and then dipping in, imitating Jesus act during the epiphany revelation. The legend says that when Jesus was being baptized, the Holy Spirit came and revealed that he, Jesus, is the son of God. It’s said that a dove from heaven delivered this news. The traditional date for this celebration on January 6th. However, because of the 13-day difference between today’s calendar and Julian calendar in the old times, Russia and eastern countries celebrated the day of epiphany on 19th instead. In western Christianity, epiphany also commemorates a couple other events: The adoration of magi and the wedding at Cana. The adoration of magi is an event where a star led the Magi, in form of three kings or wise men, to the baby Jesus. When they finally met the baby and his mother, Mary, the kings offered their loyalty and also gave them plenty of generous gifts. In many parts of the world, Christians celebrate this event with children related events, such as children parade and charities for children. In Spain, children don’t their gift on Christmas, instead, they get their gift on Epiphany Day. The wedding at Cana is another biblical event when Jesus and his mother attended a wedding at the village Cana. According to biblical records, when the host ran out wine to serve the guests, Jesus instructed to fill the jug with water. The water then turned into wine. This famous event marks the first miracle of Jesus. Earlier records of Epiphany tradition in Russia. The ritual is said to have existed since the paganism era, which then modified with the coming of Christianity in Russia. Earliest record available about this tradition is from the 14th century. Tsar at Moscow held a celebration on the court with magnificent the blessing of the water procession. The record shows that this celebration was as grand as weddings and royal coronation. Orthodox Priests lead this procession. After the procession in the palace, the tsar and family would head to the frozen Moscow river. There they have a pavilion erected on ice. The structure is adorned with holy icons depicting scenes from The Baptism of Christ. The Tsar would dip his cross into the water which then sprinkled into tsar’s banner and army for a blessing. The holy water from the river then brought back to the palace. Then the priest would sprinkle the Kremlin with the said holy water. This event marks the ritual that would later be adapted by million of Russian throughout the country. During the Russian Empire era, a smaller scale of the procession was held at the churches around the country. The Orthodox Christian in Russia celebrated the Day of Epiphany on January 19th instead of on January 6th like other branches of Christianity. 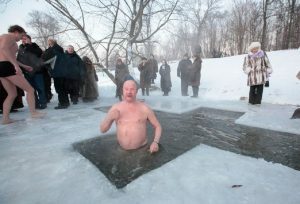 Epiphany in Russia is a famous ritual where people cut holes in a frozen river and dipping their body in the freezing water, sometimes below 30 C temperature. However, this practice was only started in the 1990s. There is no record about such ritual in the past. The new tradition was only popularized recently. The bathing ritual symbolically means washing away one’s sins from the past year. The dipping is done three times, to honor the holy trinity. Before, the Orthodox priests lead the blessing procession to bless the water. The location for the procession isn’t limited to frozen lakes only. Russians believe any water source on Epiphany Day is blessed, even tap water! After the dipping and the plunging, Russians would bring the blessed water home. They will use it for various purposes. The blessed water is said to have healing properties, so Russians drink it to cure illness and improve health in general. Russians also use the water to bless their home, their family, and themselves. They also store it for later use, it’s only once a year you get holy water. So there it is the history of Epiphany tradition in Russia. You might want to plan your travel to Russia accordingly if you want to experience The Epiphany day in Russia. Visiting Russia during winter might sound like a bad idea, but don’t be mistaken. Not only that Russia is like a fairytale dreamland during winter, but there are also a lot of fun things to do in Russia in winter. For the destinations, refer to the list of winter wonderland destinations in Russia. Read this article if you want to find any possible activities in Russia during the winter. There are also some useful tips for traveling, such as what to pack in your luggage during the winter trip and most importantly, how to survive the winter. Because winter in Russia can be deadly freezing especially for tourists who not used to such weather. Additional tips, if visitors want to keep stylish during the trip. Steal Russian women’s winter fashion style.